Every night of the week. An online, week-by-week, real-food cooking class that makes eating healthy SIMPLE, EASY, QUICK and DELICIOUS. It happens in kitchens across America every week. You know, where you go to the store with the best of intentions. You buy all the kale, broccoli, and other pretty veggies. You get them home, stock up your fridge, and think: It’s gonna be a good week! Then stuff happens… and fast forward a week later, you find yourself throwing away a bunch of wilty kale and smushy veggies. Every now and then there’s a night when it works. You make an awesome dinner for the fam and even if it takes you 45 minutes. It’s a WIN. And when you feel like you’re winning at dinner, it feels like WINNING at life, right? What if there was a way to WIN at dinner every night of the week? Without spending 45 minutes to an hour each night to do it? What if cooking a healthy dinner could be easier and faster than takeout? YOU HAD ME AT PASTA. It shouldn’t have to come with a bunch of rules. Or mean having to count and weigh things. Or skip whole food groups. I believe simple, easy, beautiful and delicious food IS healthy. And visa versa. You see, I don’t do complicated recipes. Most nights I don’t do recipes at all. I prefer old-school style - how my Nana used to cook. No cookbooks, no Pinterest. Just real food. Lots of veggies. And leftovers. Always leftovers. I believe that somewhere between The Food Network and #instafood we got tricked into thinking this whole plan-shop-prep-cook thing is a lot more complicated than it needs to be. And it’s made those three little words - “What’s for Dinner?” cringeworthy. Now you’ve got marked up pre-made meals at the grocery store, meal kits you can have delivered to your house and weekly meal plan subscription services all designed to just make eating food at home manageable. All of those things are great and all. Thank god for them, really. Only problem is, without them, you’re lost. Skip a week, and you’re back to Domino’s on speed dial. And either way - the meal kit, or pizza delivery - it gets expensive. Then you combine that with every diet trend or headline you’ve ever heard about, and “healthy” feels like Mount Everest. 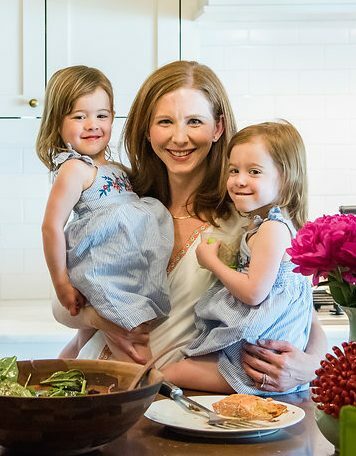 It wasn’t until I was diagnosed with a chronic condition in my early 20s that I slowly started dipping my toe into the organic produce section of the grocery store and venturing into the kitchen. I call myself a self-taught cook. And I have the knife and burn scars to prove it. I don’t have any special cooking talent (clearly). But I don’t think anyone does, really. That’s the beauty of cooking. Anybody can do it. Heck, that’s how you learn. You just gotta get in the kitchen and do it. For me, I knew it was something I had to figure out if I was going to take charge of my health. I felt the difference just eating more greens and less stuff out of a bag and my spark was lit. But it wasn’t like the rest of life slowed down so I could cook… Quite the opposite in fact. Doing healthy? hard? Ain’t nobody got time for that. I’m the first to say it. I get it, I’ve got two 3 year olds. Not gonna happen. Well, I’ve created a program to show you exactly that. I learned the trick is in working smarter, not harder. Imagine if cooking didn’t feel like such a chore. Imagine coming home after a long day and dinner’s half done already. And you can throw a super nutritious and delicious dinner together in just a few minutes. 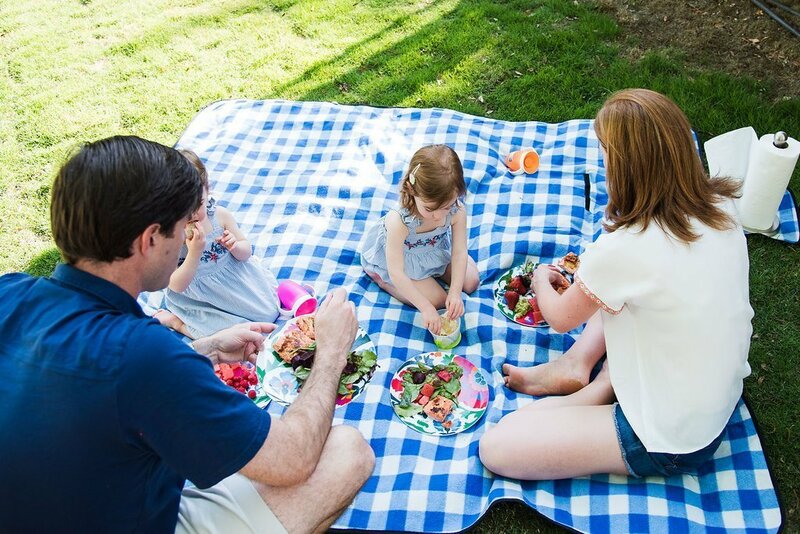 Imagine sitting down at the table with your family and knowing you’re feeding them a balanced, whole-foods meal you made totally yourself. Even if your kids still won’t touch the broccoli, at least it’s on their plate - you did it. And maybe one day they’ll forget to protest and take a bite. You gotta start somewhere, right? Dinner in 10 helps make it a whole lot easier. Learn how to cook with real, whole foods and get dinner done in 10 minutes most nights of the week. Dinner in 10 is my system for re-simplifying food and conquering the week… from the kitchen. Dinner in 10 is more like an anti-diet. It’s not meant to be restrictive in anyway. It’s going to expand your meal menu, add in a lot more veggies and nutrient-dense foods - probably more than you’re used to (sorry, not sorry). ;) and show you what a healthy, balanced whole-foods diet can look like. No need to ditch your old stand-by’s. Keep enjoying your favorite cereal, chips, snacks, ice cream. Just add in as much from the meal plan as you can. Use what works for you, in your life, the way you live it NOW. We’re all individuals and there’s no one meal plan, or right way of eating for everyone. If there were we’d have this whole “what to eat” thing figured out by now. The best part is, you won't be doing it alone. You'll have the Dinner in 10 virtual community, which is like having a bunch of green smoothie-drinking, kale-pushing (but not in an annoying way) friends that make you want to order the salad too. Dinner in 10 gives you the system, the support and gets rid of as many of the excuses and obstacles as possible, so you can really do this. Unlike pre-made meals and dinner ingredients that come in a box, Dinner in 10 shows you how to DIY it. It teaches you how to fish (so to speak). At the end of 4 weeks, you'll have this system down. And you'll save money in the long run, too. Best of all, you'll be feeding yourself and the ones you love healthy, simple, beautiful, delicious food for. evah. 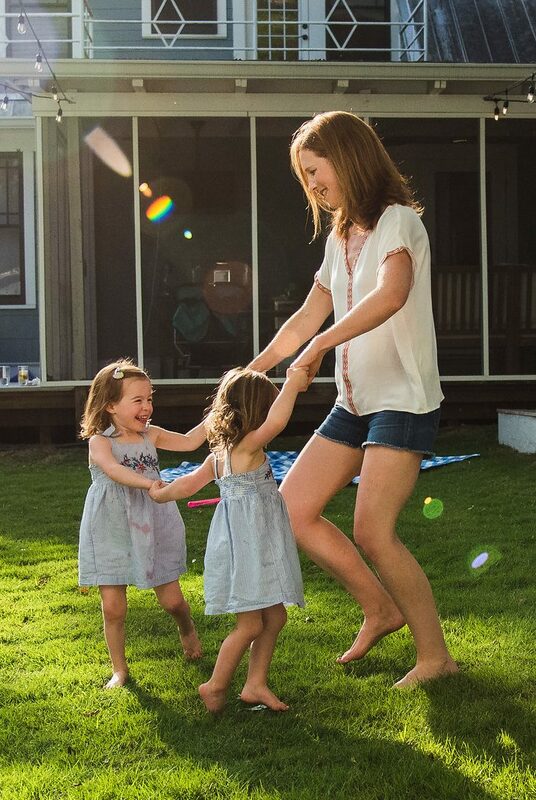 ​With Megan’s meal plans I can get dinner ready in 10 minutes leaving more time for the kiddos and me. Before, I’d always feel too exhausted to cook anything at the end of the day and we’d end up eating poorly because of it. With the meal plans I’m prepared for the week, everything’s ready to go, so no excuses. The meals are fast and easy and there’s less mess and clean up, too. It’s been life changing! When you sign up for Dinner in 10, over the course of the next 4 weeks you’ll get everything you need to take all the thought, planning and stress out of what the heck to eat for the week. Each week, you’ll learn the ropes as you follow the steps. Weekly meal plans that include a complete 5-day menu with options for breakfast, lunch and dinner. Follow the plan and recipes exactly or keep it loose and take what you want and leave the rest. Customize meals with the extra recipe section to make meals that you love, too. Done-for-you shopping lists with everything you’ll need from the store so you can get your shopping for the week done in just one trip. Items for breakfast and lunch are noted so you can follow just the parts that you like. Step-by-step prep instructions to get the bulk of the prep work knocked out all at once - in an hour tops. This part will save you hours during the week. “How to” videos walk you through every step of the way - from how to set up your kitchen with the right equipment (it’s less than you may think! ), pantry staples, how to dice an onion and other essential kitchen skills, and how to change up the recipes in Dinner in 10 so you can keep using the meal plans while keeping it interesting. The Dinner in 10 community - Our members-only closed Facebook group for everyone who’s doing/has done Dinner in 10. 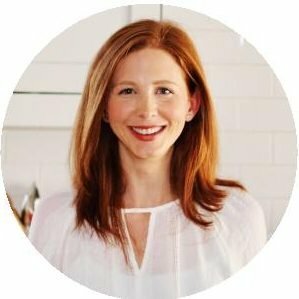 It’s where you can connect with others who want to cook and eat healthier too; ask and answer questions, share pics, ideas, wins, etc. I’ll be in there to answer questions and chat too. Bonus cooking guides to help you make your own delicious and healthy salads, smoothies, salad dressings and more. These guides give you simple formulas to follow that you can use to customize your own creations. Pretty + handy cooking cheat sheets to hang or keep in your kitchen to help you with things like how much water do I need to cook rice? And what temperature do I cook chicken to? 24/7 support through both the online community as well as access to me via email to ask any questions that you may have. My 100% commitment to your success and making Dinner in 10 work for you. Unlimited access - Your Dinner in 10 content and materials are yours to keep forever. You’ll always have access to the meal plans and videos so you can go back to any part of the program at any time. ​​It was so easy to follow and made me excited to cook even after a long day of work. There was a great variety of meals so I never got bored eating the same things like before. With all the shopping and prep work done on Sunday, all I had to do was throw everything together and I had a delicious meal ready in 10 minutes. It really works! Even after finishing the month, I still go back and cook meals from the weekly meal plans every week. I love dinner in 10! You’re tired of eating the same ol’ things for dinner every night. You want to eat healthier but you’re not sure where to start. Shopping, prepping and cooking on top of everything else in life feels like just too much. You’re confused about what the heck to eat and all the different diets out there just make you want to reach for a piece of pizza. You want to eat healthier but it feels like so much work. You have to follow a specific diet (like gluten or dairy free) but don’t want to feel restricted… or better yet, you want to still be able to feel like you’re having your old favorites with alternatives. You’re tired of having to sacrifice taste for nutrition. You want to get more greens in but don’t just want to be eating salads all day. 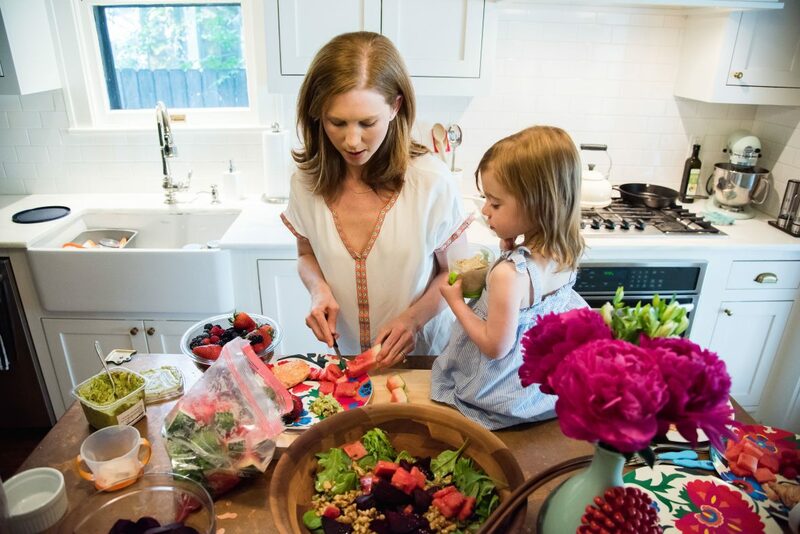 You want your kids to grow up eating and loving vegetables but it feels like a losing battle. You’re looking for your next diet or rigid eating plan with a bunch of rules and restrictions. Dinner in 10 is NOT a diet. And is not meant to be restrictive in anyway. I can’t stress this enough. You prefer cooking with complicated recipes that have a laundry list of ingredients every night of the week. You don’t want to learn to cook, aren’t going to cook, or even try. You don’t like wholesome, easy, delicious dinners. I was surprised that only after a couple days I felt better and had a lot more energy. The best part was seeing my six year old get into it. Every night she’d ask all excited, “What’s for dinner tonight? !” It turned what used to be a dreaded question in our house into a delight. I was also just happy that I could still eat pasta. :) I can’t tell you how refreshing it is to feel like I’m eating healthy without following a particular diet. I learned so much about food and what healthy really is and I feel more balanced myself. The entire 4-week program is available now for $199. This includes the complete program and system, all of the meal plans, shopping lists, step-by-step instructions, guidebooks, cheat sheets, Dinner in 10 community and access to me, your health coach. And there’s a 100% risk-free, money-back guarantee. If you start the program and if, for whatever reason, it’s not right for you, I’ve included a 7-day money back guarantee. How many people do the recipes serve? All of the dinner recipes in Dinner in 10 are written for 3-4 people (or 2 adults and 2 small children). Some will have leftovers that you’ll use in subsequent meals, too. Breakfasts are about the same 3-4 people (or 2 adults and 2 small children). Lunch varies but generally assumes you’re just feeding yourself. Dinner in 10 includes a variety of flavors and ingredients to get you cooking different things in different ways. All of the meals are made with whole, real-food ingredients, with an emphasis on the veg. You'll be eating old favorites like pasta primavera, roasted chicken and vegetables, stir-fry, salmon, pork chops; and healthier takes on old favorites like tacos, pizza and pasta Alfredo. Breakfast and lunch options include things like smoothies, grain bowls, pre-made salads and wraps. Can I still have bread, sugar, alcohol, etc.? YES! YES! YES! Dinner in 10 is NOT a diet. I repeat. This is NOT a DIET. This is a program to help you eat more whole, real foods, and make eating generally healthier easier and more accessible for you. If you like having a bread roll with your dinner. Keep having it. If you eat ice cream for dessert, don’t stop. Do use the meal plans to add more whole, real, nutritious foods and meals to your week. Just take it one meal, one day, one week at a time. Usually what happens is as you add in more nutritious, healthy foods to your diet, they naturally crowd out the not-so-healthy stuff. Just see what happens…. What can I expect to spend in groceries? Around $150-$200 the first week or two, less after that. In these first couple of weeks you'll likely be spending a bit more if you need to stock up on some of the pricier pantry staples like oils, nuts, spices etc. Once you have these items in stock though, week to week you should see a reduction in your weekly grocery bill, especially if you're going from a more processed or ready-made meal shopping list. Fruits, vegetables, whole grains, etc. cost a lot less than packaged and pre-made food. Studies show it takes about a month to make something a habit. Dinner in 10 cuts out the planning part and reduces the stress around meal prep so you can focus on the fun part: the actual cooking and eating. It’s kinda like learning how to meal prep with training wheels. 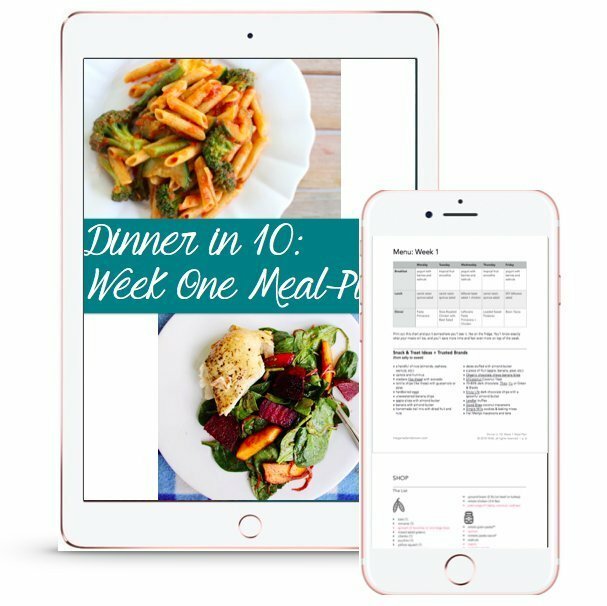 The done-for-you plans, step-by-step instructions and helpful tips make the whole thing so much easier and lets you get in the groove of preparing wholesome, healthy and delicious dinners during the week. Most importantly, you’ll get used to a process that helps you get dinner together in around 10 minutes most weeknights. And that’s something you can really stick with! What if I’m traveling one of the weeks? No prob! Dinner in 10 is designed for you to be able to go at your own pace. Just pick right back up where left of when you get back. You’ll always have access to the meal plans, videos and content so you can come back to them again and again. What if I start and something comes up and I don't have time? When you purchase Dinner in 10, you're buying the program for life. You'll always have access to the meal plans, videos, materials, etc. It's designed so you can follow the program at your own pace, however it works best for you. Each meal plan and accompanying videos and materials are released week by week so you only have to think about what you're doing that week. I don't want to overwhelm you with a bunch of plans and recipes that you don't need - that's why we do it that way. So, if you have an off week, just skip it and come back to it at the end, or try it again the next week and keep going from there. It's totally up to you. What about when it’s over? Keep going! By the end you’re going to feel more comfortable and confident in the kitchen. Take the recipes and plans from over the past four weeks and continue to use them as is to make your life easier, or get creative, change them up to make your own with other recipes from Dinner in 10, recipes from meganadamsbrown.com or your favorite recipe sites and blogs. I’m following a paleo (or gluten-free, dairy-free, etc.) diet. Will Dinner in 10 work with this way of eating? Absolutely. 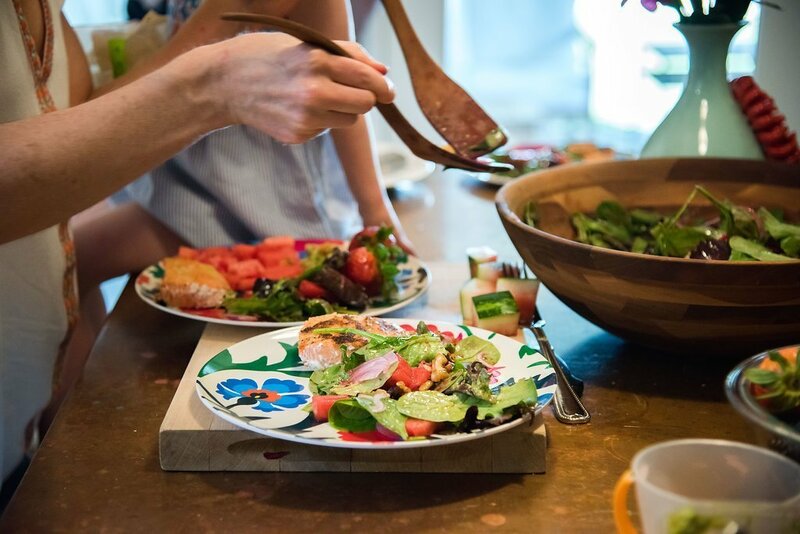 Dinner in 10 is designed to follow a balanced, whole, real-foods diet. That the foods be whole, and real are the only requirements. That being said, it leans toward and can easily be modified to be 100% paleo. With just a few modifications, you’re there. It’s also mostly naturally gluten-free, dairy-free and soy-free, simply because most whole, real, nutritious foods don’t contain these ingredients. So if you’re following one of these ways of eating, Dinner in 10 is a great way to make it a little bit easier for you. ​I’m vegetarian or vegan. Can I skip the meat and still use Dinner in 10? While there are some vegetarian and vegan meals included in Dinner in 10, the majority of the meals do include meat or fish - probably 75 percent. I’d say it would be hard to omit animal proteins and ensure you’re still meeting nutritional needs following this plan. ​I’m pregnant or breastfeeding. Will the meal plan meet my nutritional needs? I can’t see why not! Dinner in 10 is not a diet and it’s not meant to be exclusive, as in, you can only eat these foods. Think of it more like the foods in Dinner in 10 are ideas to help you add more super healthy foods to your diet and make it easier to get them in regularly. Keep eating your old favorites, and eat - please EAT - foods that aren’t included in these plans. No rules here. No restrictions. Ever. Of course, always consult your physician if you have diet concerns or if you’re making any major changes to the way you’re eating. This entire 4-week program is only $199. That's about $49 a week - what you could easily spend on takeout for a family, in just one meal. If you start the program and if, for whatever reason, it’s not right for you, I’ve included a 7-day money back guarantee. See you in Dinner in 10!